“I think you guys will be surprised by how easy this hike is,” managing editor Nathan Gunter told Steffie and me a few days before our trek to Oklahoma’s highest point, Black Mesa. I had not worried about it much in the days before, until I saw multiple warnings about rattlesnakes and hyponatremia (low sodium) on a Facebook post. Nathan was the only one among us that had made the ascent, and I needed his reassurance that I was not willfully marching toward death in the desolate high plains of Kenton, Oklahoma. He replied that he and two others had walked to the top of Black Mesa in the blistering heat of July. It would be fine. I like to be outside, but I’ve never been one for walking up hills. I prefer to admire great heights rather than conquer them without a motor. People who risk death to climb Mount Everest baffle me. I’ve been overtaken by heavily pregnant women and taunted by athletic children during the few strenuous hikes I’ve embarked on in my lifetime. I have never gone on one knowingly. The realization that I’m on one never comes until I’m in too deep to turn back. And when that happens, the only thing to do is to continue up that endless hill until I get where I’m going. I guess I could turn back, but the car is probably parked at the top of that hill or one of my more ambitious fellow hikers with the keys to the car has left me behind. In this case, Steffie gave me the keys to her car before we began the hike. Upon seeing the mesa in person, I made several forlorn comments about its height a day earlier when we arrived at Black Mesa Bed & Breakfast and thus had not fostered confidence in my hiking companions about my willingness to make it. Still, we were right there, and I wanted to see the landscape from 4,973 feet, so I thought I might as well try. Steffie, still doubtful of my resolve, wanted to take precautions. Both she and Nathan had been eagerly anticipating this undertaking, and no one would hold them back. It was a perfect day for hiking—65 degrees, clear sky, and light wind. 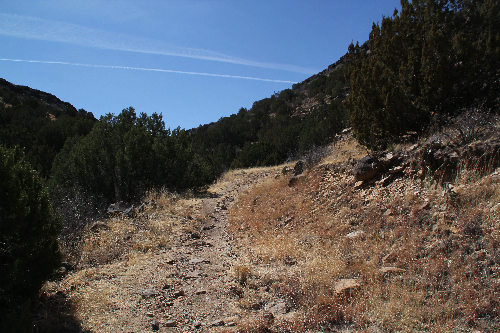 I strapped on my hot pink Family Dollar children’s backpack, and set off from the parking lot of the Black Mesa Nature Preserve, where the summit trail begins. From the parking lot to the top, it’s 4.2 miles long, one way. The first two miles is on relatively flat surface through pastureland until you begin an incline to the top that lasts for about a mile. Not soon after we started, Steffie and Nathan went back to the car to look for binoculars, and I was left to wander and observe on my own. 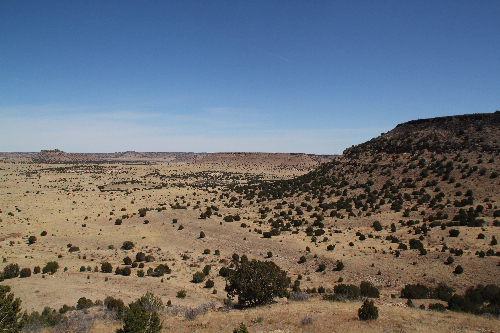 Contrasted with the stubborn flatness that dominates most of the panhandle, the Black Mesa area is an alien expanse of yellow mesas leopard-spotted with scrub brush, reminiscent of a landscape from a Dr. Seuss book. It was here that dinosaurs roamed millions of years ago, before men and their cattle followed in their Jurassic footsteps (which can still be seen). In this sparsely populated and largely undeveloped corner of the state, it’s easy to feel like you’re one of the only people on Earth. There’s no traffic hum, no sounds except wind shifting through the grass and cows groaning. Soon after Nathan and Steffie caught back up, my own groans began to escape me. The hiking trail happens to be an old cattle trail, so it’s not particularly direct. I didn’t know this at the time, and I repeatedly cursed its designers for the illogical, wide-arcing path that seemed to take us farther away from the mesa before winding its way back. The ground is embedded with rocks, which required me to vigilantly monitor and readjust my footing to keep from stumbling. However, when I wasn’t watching the ground, I was able to appreciate that I was spending my Tuesday in a peaceful valley surrounded by sunlit mesas instead of staring at a computer screen. When we finally reached the base of the mesa, I was already a little tired. We went about fifty feet up our first steep stretch of the switchbacks before I took off my backpack, sat down, and make a declaration. “Well, after this you don’t have to,” said Nathan, undoubtedly growing weary with my complaints. “Oh, we don’t?” said Steffie. It took me several minutes to realize that her question had not been in earnest. She continued on with Nathan, figuring I was done, but she was wrong. I chugged my orange Gatorade, applied Aquaphor to my lips, and strapped my children’s backpack back on. I trudged a ways, then stopped for a minute to catch my breath, repeating this pattern for what seemed like a half hour. I was relieved to be alone. This way, I could keep my buzzkill attitude from potentially dampening the enthusiasm of my editorial companions. I swore at nothing and breathed deeply while I fantasized about Hoveround mobility scooters and escalators whisking me up the rest of the way. As I continued to ascend, the view of the valley and its rocky outcroppings grew more and more impressive, and my swearing shifted from words of frustration to words of awe-tinged frustration. I thought I saw a vulture soaring in the distance, but I have bad vision, so who knows. I briefly caught up again with Steffie and Nathan, who were pleasantly surprised to see me, and then I stopped to take photos before I hiked up the remainder of the path. A bystander might have thought I was raising my arms in victory when I reached the crest, but the truth is that I threw them up in indignation when I saw that there was about another mile to go. 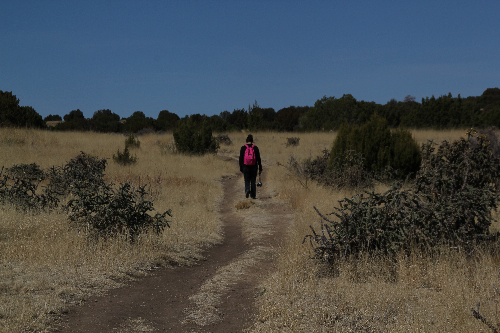 I could see my fellow hikers ahead, tiny silhouettes in the distance, across the top of the flat mesa. 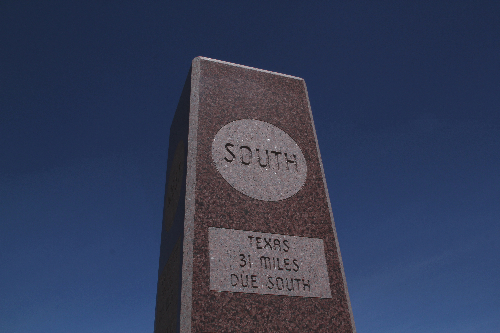 Where in god’s name was this highest-point marker? Turned out, it was there, after about twenty more minutes of walking. We celebrated our arrival with slices of hard salami, cookie bites, and more water. In the end, the exertion turned out to be worth the view. I will probably never hike to the top of Black Mesa again, but I’m glad I can say I did it once.